This small, but unusual church in north Asheville incorporates both architectural and theological significance for the community. The church and its founding Vestry were a part of the �Oxford Movement� establishing the Anglo-Catholic church (the �High Church�), started in England 1833 and brought to North Carolina and the mountain region by Bishop Levi Silliman Ives in 1849. Reverend Charles Mercer Hall, a charismatic member of the Anglo-Catholic movement, came to Asheville in 1913 to recuperate from a respiratory ailment. When he arrived he was the pastor at Trinity Episcopal Church where he attracted enough parishioners to build St. Mary's Church. St. Mary's was constructed in 1914 in a cruciform plan in an English Gothic Revival style, incorporating the �correct� ecclesiastical style of Edwardian Anglo-Catholicism. Both the interior and exterior elements of the building reflect the characteristics of Anglo-Catholic churches in England . 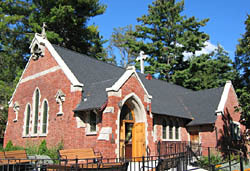 The red brick church was built with a stone foundation and a steeply pitched gabled roof. The windows are pointed arches with leaded glass diamond panes. Prominent local architect Richard Sharp Smith designed the building and much of the interior furnishings. 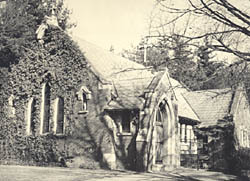 The rectory stands behind the church and was built in 1925, also designed by Smith. Chauncey Beadle, gardener at George Vanderbilt's Biltmore Estate, developed the landscape plan. 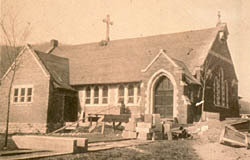 St. Mary's is the only Anglo-Catholic church in North Carolina. The parish continues the tradition of hosting the many visitors aware of St. Mary's reputation. Grace Kelly and Charlton Heston worshipped here and noted author Gail Godwin, a parishioner of St. Mary's, incorporated the church and other Asheville environs in her novel, Father Melancholy's Daughter. St. Mary's Church is located at 337 Charlotte St. at the intersection of Macon Ave., across from Grove Park . For more information call 828-254-5836.